Now that you have a map, you’ll want to add layers to it. The first layer you’ll add is a choropleth layer to shade world countries by web log traffic. Darker shades symbolize countries with more web log traffic, and lighter shades symbolize countries with less traffic. In the map legend, click Add layer. Click the Vector shapes data source. From the Layer dropdown menu, select World Countries. Click the Add layer button. Set Layer name to Total Requests by Country. Set Layer transparency to 0.5. You must add the web log traffic property to the world countries so that the property is available for styling. 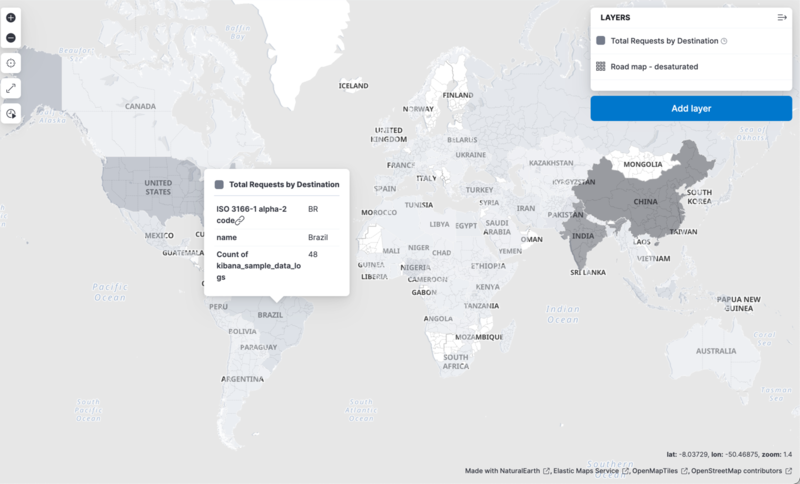 You’ll create a terms join to link the vector source World Countries to the Elasticsearch index kibana_sample_data_logs on the shared key iso2 = geo.src. Click plus to the right of Term Joins label. Set Left field to ISO 3166-1 alpha-2 code. Set Right source to kibana_sample_data_logs. Set Right field to geo.src. The final step is to set the vector fill color to shade the countries by web log traffic. Click to the right of Fill color. Select the grey color ramp. In the field select input, select count of kibana_sample_data_logs:geo.src.